Red Fox Lodge-Ski Season Discounts Available!!! Welcome to Red Fox. This 5000 Sq. Ft. Home has seven bedrooms plus five and a half baths.This gorgeous expansive home also has a game room and an eight person hot tub.This property backs up to miles of national forest. The home is in Blue River south of Breckenridge. Just short drive to town 7.3 miles. The views from this home are unprecedented.The huge windows in the home look upon the Continental Divide and the 14,000 ft. Quandary Mountain. The views and beauty of nature are even better from the eight person hot tub on the sunny wrap around deck. Dining for 16. Enjoy seclusion and easy access to summer and winter activities here at Red Fox. All pets are welcome here at Red Fox. The entire main level is tiled as well has offers a dog door and a fenced in yard. Sleeping Arrangements: Top Level:#1 Master Bedroom has a King #2 Bedroom Two has a King. Have been renting on vrbo for 15 years. Also owned large property management company in Breckenridge and sold it 5 years ago. I also own the one of the largest developments in Breckenridge, Western Sky Ranch, 250 acres only 2.5 miles to town. This property we have owned 10 years. It is one of the best values you will find on vrbo. We just try and keep it rented. 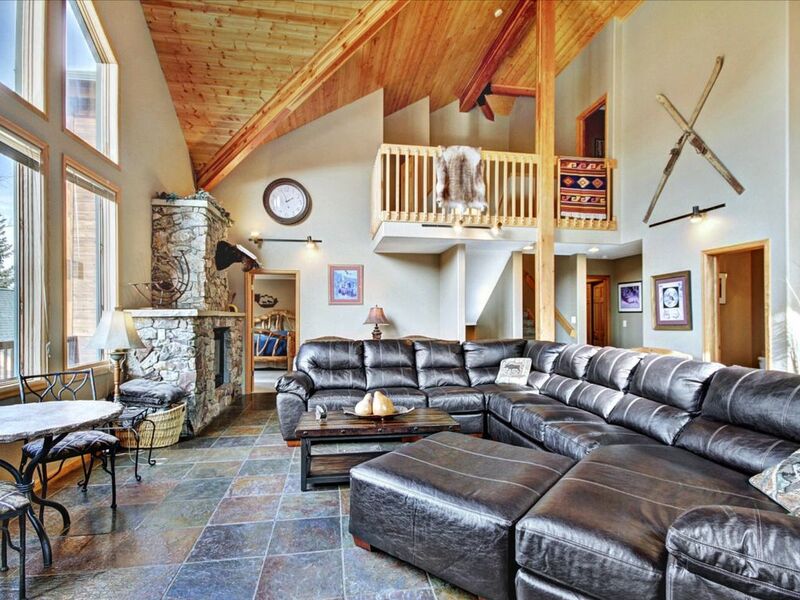 It is private, national forest behind, and sincerely has the best views of any other property in Breckenridge. It is up to date with everything. We always ask out guest how we can improve the property and always try and make it better each year. Great value. huge 5000 sq.ft. home, best views of all the homes in Breckenridge, short drive to town.Suggestion when you rent a home always get the best house you can because when u drive 5 minutes or ten it really does not matter. Three, six or eight miles just get best home for yourself and the best price. We were a big family and the house was spacious enough for all. Good layout and living area with awesome views! The house was very roomy and comfortable - much of our time was spent socializing in the living room and down in the game room. The views were gorgeous and the property in general was well-maintained. Pretty, clean, and lots of room. We had 6 families with 18 people. Bedrooms were all large and 4 of the bedrooms had their own bathrooms. Only thing we would change is bottom floor bathroom. Bottom floor had a bedroom with 1 large bed, a bedroom with a bunk bed and 2 twin beds, and room with a large bed (but no door) and they all shared the smallest bathroom in the house. We made it work and still had a great experience and would recommend. Front porch/living room had a beautiful view of the mountains. Kitchen/dining/living were spacious and had enough furniture to hold our entire group. Thanks so much for this review. Hope to see you again. This house was so amazing!! Me and a large group of friends rented this house for a bday weekend getaway and it could not have been more perfect!!! There is plenty of space and the beds are so comfy. The couch in the living room could fit 5 people to sleep on its own. Game room was awesome. Location was great. Hot tub is in the perfect spot. All in all a perfect getaway home. 10/10 would recommend to a friend. This house was absolutely AHHHHMAZING!!!!!! It has a nice open floor plan for larger family gatherings. This house was everything our family needed and more!! The location was great close to town and ski resort. The hot tub was a VERY necessary and appreciated bonus after a full day or skiing and snowboarding. The owner was extremely nice and easy to get a hold of, allowing us the opportunity to check in early. Our family gets together every year and alternates mountains to ski on, we go above and beyond to find a big enough rental to accommodate us ( parents, 6 siblings, 5 grandkids), this by far was the best house we’ve booked in the last 4 years!!! Thank you sooooo much!!!! This review is wonderful. Thanks for it and hope to see you again. **In the quote under taxes, the sales tax, property tax, housing tax, HOA tax is all complied in the 12 percent figure. THERE ARE NO REFUNDS. WE STRONGLY RECOMMEND TRAVEL INSURANCE. WWW.TRAVELGUARD.COM IF RENTER IS UNDER 24 YEARS OF AGE, AN ADDITIONAL CASH DEPOSIT OF $1500.00 ( I.E. CASHIERS CHECK, MONEY ORDER) WILL BE DUE 30 DAYS BEFORE CHECK IN. NO CREDIT CARDS FOR DEPOSIT WILL BE ACCEPTED. IF DEPOSIT IS NOT RECEIVED BEFORE OR ON THE 30 DAYS, RENTAL WILL BE CANCELLED WITH NO REFUNDS. ONCE IT IS ESTABLISHED THERE WAS NO DAMAGE, THE DEPOSIT WILL BE RETURNED 30 DAYS AFTER CHECK OUT.